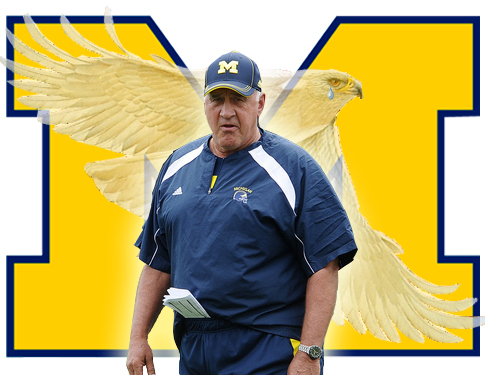 Staples of this blog last year were posts that lauded Greg Mattison's awesome NFL-style zone blitzes. Michigan didn't really use them all that often against Alabama and rarely had an opportunity to against Air Force because of the offense they run. But fortunately, on second viewing of the game, one blitz late in the first half stood out as another piece of Mattison mastery. 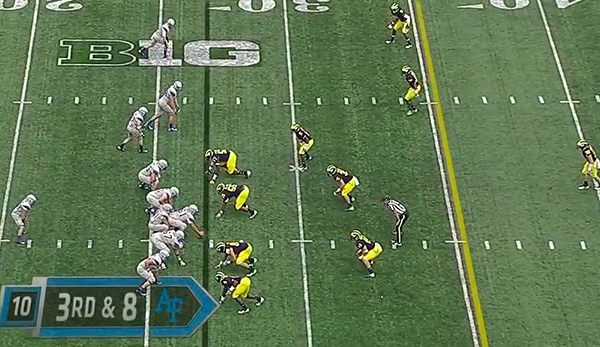 With six minutes left in the first half, Michigan gets Air Force in a 3rd and 8 passing down. The team lines up in its Super Nickel package: Craig Roh (#88) and Jibreel Black (#55) at defensive tackle, Frank Clark (#57) and Cam Gordon (!!! ; #4) at defensive end, two linebackers, three corners, and two safeties. Almost any time Gordon lines up with his hand in the ground as a defensive end, I get angry, but this is the first time Mattison has actually done something innovative with it. As the ball is snapped, all four defensive linemen begin to rush. In a moment, Gordon (bottom of the screen) will drop out into coverage. Courtney Avery (playing nickelback) and Joe Bolden (strongside linebacker) are also blitzing. What this will do is overload the strongside of the offensive line with pass rushers. Below, you can see Gordon dropping into coverage. Roh and Black both slanted toward the weakside of the field, forcing their offensive line couterparts to follow them that way. 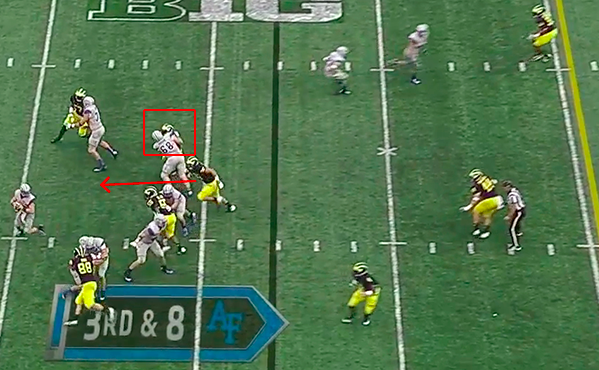 This leave the Air Force left guard to block both Bolden and Avery (highlighted). 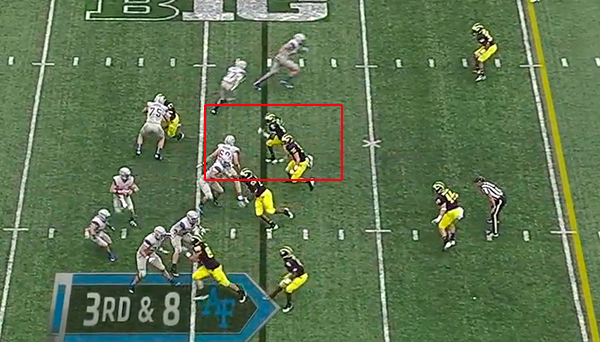 The left guard decides to block Avery (highlighted), giving Joe Bolden a free lane to the Air Force quarterback. 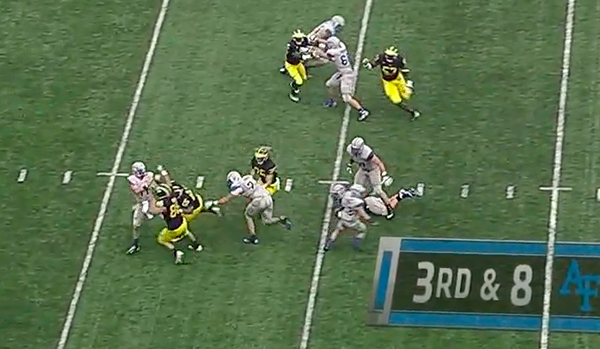 Black and Roh also beat their blocks, so there are now three Michigan blitzers in the face of the Falcon QB. Before getting the sack, QB Connor Dietz throws the ball off his back foot (hey, I've seen that before) out of bounds. This is what you pay defensive coordinators for. Much like some of Michigan's blitzes last year, the defense overloads one side of the offensive line in order to get a free rusher on the quarterback. 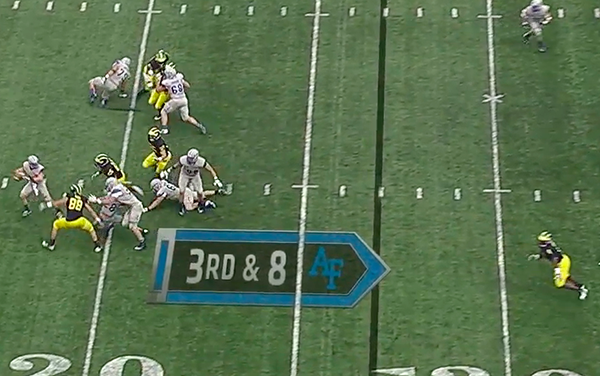 Often, Mattison is able to do that with only four rushers. Here, he uses five because, well, he wants to. You may have noticed that Jordan Kovacs is all alone in the deep middle of the field with only zone coverage underneath. This play is designed so that the need for Kovacs to make a play is the worst-case scenario. 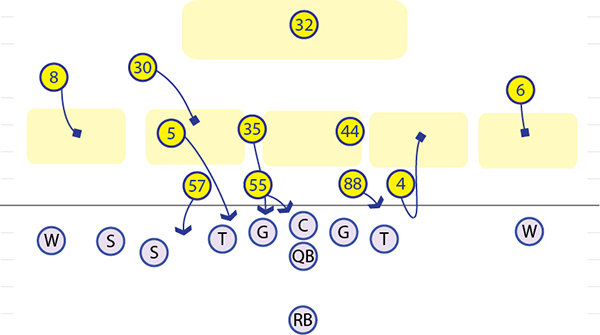 The blitz is intended to force opposing quarterbacks to get rid of the ball as quickly as possible, hence the five underneath zones. The good thing about this particular blitz is the personnel and zone assignments. A few times last year, Mattison's zone blitzes failed because linebackers or defensive linemen were asked to make unrealistic zone drops into coverage and failed to get into position on time. 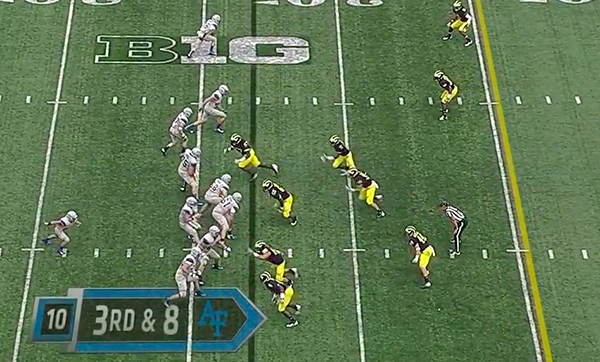 Here, the only "defensive lineman" dropping into coverage is a wide receiver free safety strongside linebacker. The rest of the zone coverage comes from linebackers, corners, and safeties who are already positioned near their coverage zones. Most importantly, the blitz did exactly what it was supposed to do, forcing an incompletion and getting the defense off the field.